Stephen Hawking's family plans to broadcast a recording of his voice toward a black hole while his ashes are interred at Westminster Abbey, according to a report in the Telegraph. His daughter, Lucy Hawking, told the British press in a statement that the recording will be set to an original piece of music by the Greek composer Evángelos Odysséas Papathanassíou (more commonly known as Vangelis) and broadcast toward a black hole in the binary system 1A 0620-00, which at more than 3,000 light years away is the nearest black hole to Earth. She said that the recording is a "beautiful and symbolic gesture that creates a link between our father's presence on this planet, his wish to go into space and his explorations of the universe in his mind." 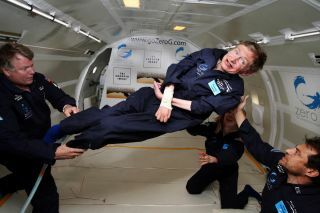 Stephen Hawking died March 14 at the age of 76. His ashes will be buried between the remains of Charles Darwin and Isaac Newton, following a memorial service Friday (June 15), according to the Telegraph's report.